Just graduated high school last April 7. I'm currently on my vacation before finally entering the crazy world of college life. My course (Advertising) has something to do with multimedia (editing stuff, photography, etc...) so I'm taking the opportunity this vacation to improve even just a little. This wall is, right, my first full vector wall. Although I already vectored before in this collab wallpaper. PAOPORSCHE - the one who told me to learn how to vector :P a simple comment on his wall led me to him and its nice to know we're both Filipinos. I admire his style of parody collage-like style of walling so much. He contributed a lot to me even though he's really busy in real life. Wow! Wonderful vector and wallpaper. You have done a great job... I like very much. For her expression, she really has a beautiful dream. Congratulations and thank you very much for sharing :). 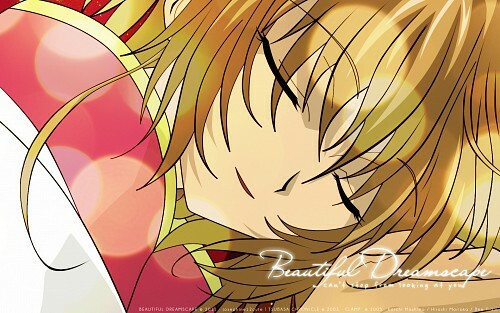 Sakura look so cute in this wallpaper with the way she's sleeping, she looooook soooooooo cute. First vector ever? That's really AWESOME for the first vector. Now you've opened the door to lot of opportunities. Wish you good luck in your next projects, and waiting for your next vector-walls. And congrats with first vacation-/vector- wallpaper!